When it comes to saving lives on short notice it's important for the individuals providing care to have the proper EMS gear readily available. It is not just the knowledge of the person using this equipment; it's also what equipment is being used that saves lives.Needles are important for EMS personnel to have because there are usually a number of people that need saving who require pain medication or sedation that may not be available in pill form. Needles are also a way for the professionals to give the proper dose of medication to the patient.Stretchers are another piece of EMS gear that is always at hand. This allows a person to be carried from buildings and other areas when they have sustained injuries that make it impossible to walk without causing further damage. People who are feel faint or experience dizziness when standing also benefit from the stretchers. Other gear that is often used during emergency care include heart rate monitors, containers for disposing of biohazardous materials, and gauze. Someone may have high or low blood pressure and tools to monitor these specific conditions are also available. Biohazardous containers help keep the care providers and patients safe and this also ensures the area is kept sterile by locking germs in a closed area which makes them easier to dispose of. The containers that are used are always in bright, easy to recognize labels to avoid mistakes and confusion. Gauze and medical tape are used to cover open wounds. The gauze absorbs any fluid coming from openings and medical tape ensures the gauze remains in place. This is another safety precaution as it keeps bodily fluids from dripping onto the floor of the ambulance.This being said, all ems personnel wear gloves that protect them from any blood and fluid transference. 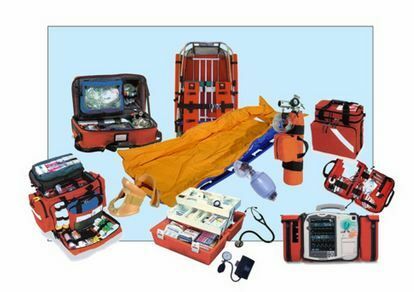 One of the most important things found in an ambulance is a medical bag. This bag holds all of the most commonly used tools in one place, making it easy to grab when making house calls or in situations where personnel need to go to the patient in a hurry. 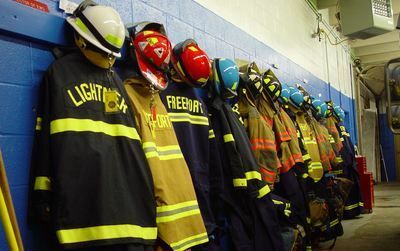 Uniforms are required to identify EMS personnel and although these uniforms vary by state, they usually come in navy blue or black. These uniforms are not only used for identification purposes, but also give patients a sense of comfort in knowing they are in the care of professionals. The uniforms include pants, top shirt that includes an embroidered EMS badge and an under shirt. In some cases the uniform pants can be switched for shorts during hot months and coats are also available for colder months. Beyond the responsibility to act fast and professionally, it's also important for personnel to make sure to restock equipment that is running low and keep safety in mind by making sure they have all proper gear with them for when they're called.